Professional Tutors instruct students in various settings and assist them in preparing for the examinations. 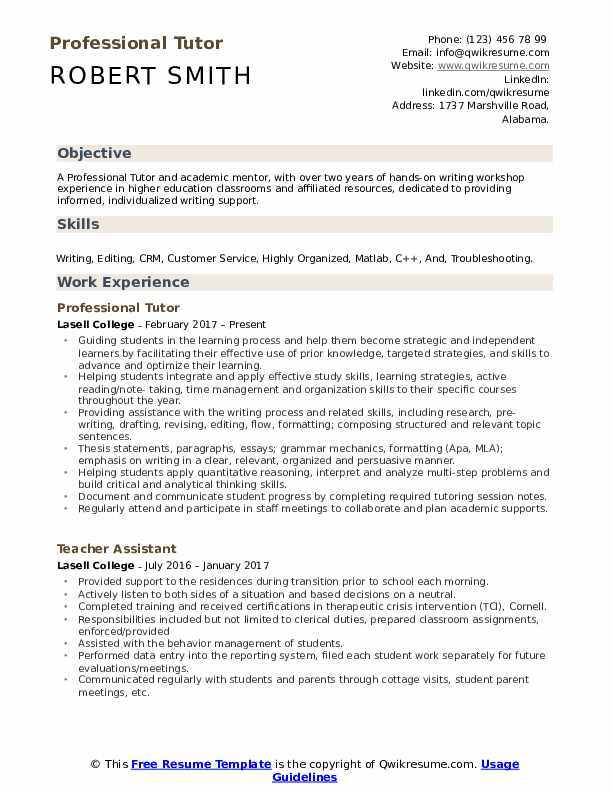 A well-drafted Professional Tutor Resume mentions tasks such as – inspiring, motivating and encouraging students; creating a productive tutoring environment, following the strategic lesson plan, assessing the student performance level, identifying the weak and strong area of the student, suggesting or tutoring on areas that need improvement, helping with home assignments, identifying student needs, maintaining records and executing all other tasks as assigned. The skills and qualifications expected from a Professional Tutor include – exceptional tutoring and instructional skills, strong communication skills, time management skills, ability to identify the weakness of the student, up-to-date knowledge of latest teaching methodologies and the potential to implement them; and a strategic approach to tutoring. A Bachelor’s degree or a Master’s degree is the common qualification mentioned in most of the successful resumes. Objective : A Professional Tutor and academic mentor, with over two years of hands-on writing workshop experience in higher education classrooms and affiliated resources, dedicated to providing informed, individualized writing support. 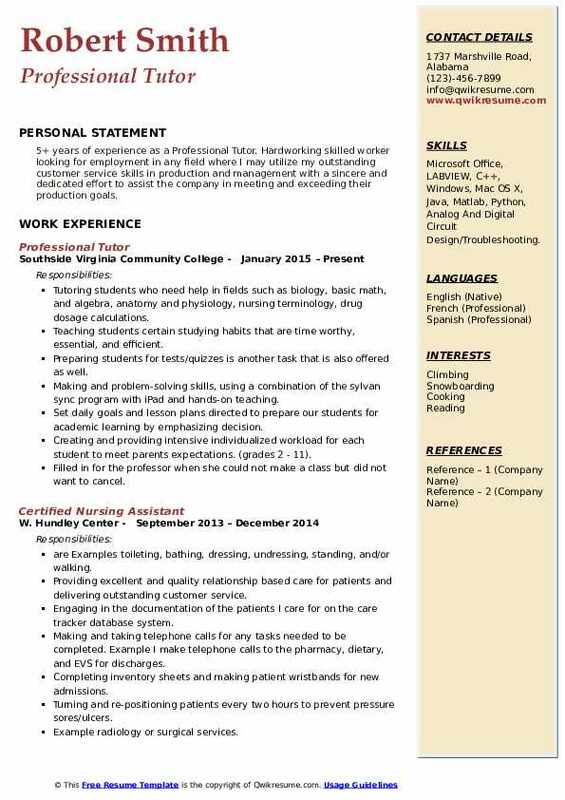 Skills : Writing, Editing, CRM, Customer Service, Highly Organized, Matlab, C++, And, Troubleshooting. Guiding students in the learning process and help them become strategic and independent learners by facilitating their effective use of prior knowledge, targeted strategies, and skills to advance and optimize their learning. Helping students integrate and apply effective study skills, learning strategies, active reading/note- taking, time management and organization skills to their specific courses throughout the year. Providing assistance with the writing process and related skills, including research, pre-writing, drafting, revising, editing, flow, formatting; composing structured and relevant topic sentences. Thesis statements, paragraphs, essays; grammar mechanics, formatting (Apa, MLA); emphasis on writing in a clear, relevant, organized and persuasive manner. Helping students apply quantitative reasoning, interpret and analyze multi-step problems and build critical and analytical thinking skills. Document and communicate student progress by completing required tutoring session notes. Regularly attend and participate in staff meetings to collaborate and plan academic supports. Supporting a welcoming and supportive learn-how-to-learn environment by creating a dynamic environment. Facilitating writing workshops embedded in various first-year composition (eng101) courses. Objective : 3+ years of experience as a Professional Tutor. Educator experience ranging from education levels k-12 and adult education. Critical thinker and effective leader in team development and project management. Proficiencies in a variety of software (i.e. Internet-based software, etc.) and customized aeronautic systems. 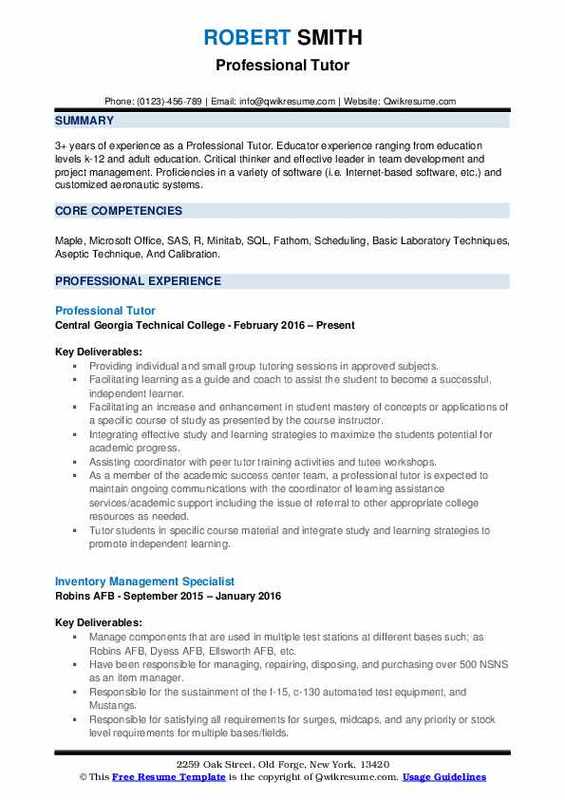 Skills : Maple, Microsoft Office, SAS, R, Minitab, SQL, Fathom, Scheduling, Basic Laboratory Techniques, Aseptic Technique, And Calibration. Providing individual and small group tutoring sessions in approved subjects. Facilitating learning as a guide and coach to assist the student to become a successful, independent learner. Facilitating an increase and enhancement in student mastery of concepts or applications of a specific course of study as presented by the course instructor. Integrating effective study and learning strategies to maximize the students potential for academic progress. Assisting coordinator with peer tutor training activities and tutee workshops. As a member of the academic success center team, a professional tutor is expected to maintain ongoing communications with the coordinator of learning assistance services/academic support including the issue of referral to other appropriate college resources as needed. 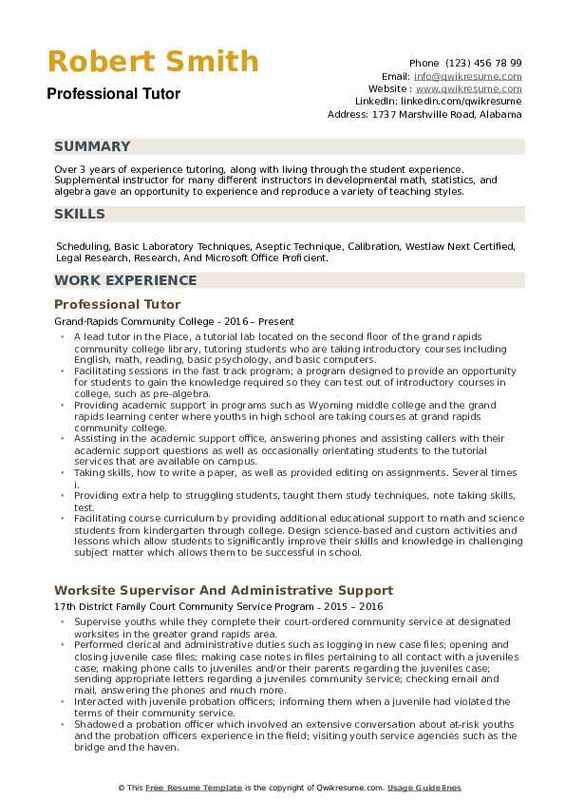 Headline : 5 years of experience as a Professional Tutor is seeking to acquire a permanent position with a stable and growing company in which I can utilize my clerical skills and work experience, further cultivate those skills and gain additional administrative knowledge. 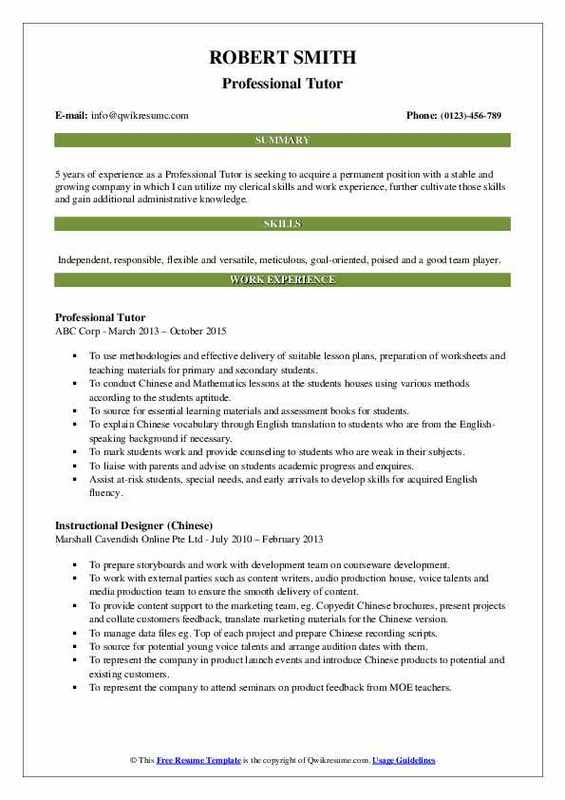 Skills : Independent, responsible, flexible and versatile, meticulous, goal-oriented, poised and a good team player. To use methodologies and effective delivery of suitable lesson plans, preparation of worksheets and teaching materials for primary and secondary students. To conduct Chinese and Mathematics lessons at the students' houses using various methods according to the students' aptitude. To source for essential learning materials and assessment books for students. To explain Chinese vocabulary through English translation to students who are from the English-speaking background if necessary. To mark students work and provide counseling to students who are weak in their subjects. To liaise with parents and advise on students academic progress and enquires. Assist at-risk students, special needs, and early arrivals to develop skills for acquired English fluency. Summary : 10+ years of experience as a Professional Tutor. Experience-tested leadership and organizational development skills Precise, detail oriented lab technique and results in analysis Intermediate fluency in German and Latin (Classical and Ecclesiastical). Skills : Microsoft Word, Excel, Outlook 365, Powerpoint, Open Office, BOLD, NCBI, Inventory Management, Customer Service, And Tutoring. Assisting students with any difficulties that they may have in their writing or grammar. Conducting problem review and study sessions with general, organic and biochemistry students. Providing further instruction to ESL students in easy to understand terms. Helping faculty as an in-class tutor in support of their lesson plans. Guiding students on the extraction of specimen DNA, gel electrophoresis visualization and PCR amplification of genes coding for the cytochrome oxidase I enzyme as part of a faculty - lead research project. Providing classroom lab support through the preparation of reagents, buffers, enzymes and computer setup for course instructors. Conducting technical literature and protocol research for faculty members. Ensuring protocols and procedures were followed with a keen eye for keeping results free from error. Summary : 13+ years of experience as a Professional Tutor. Throughout my career, I have proven my expertise in all aspects of operations management, marketing, personnel training and guidance, P&L oversight and proven my cognitive abilities, dedication and honesty time and again. 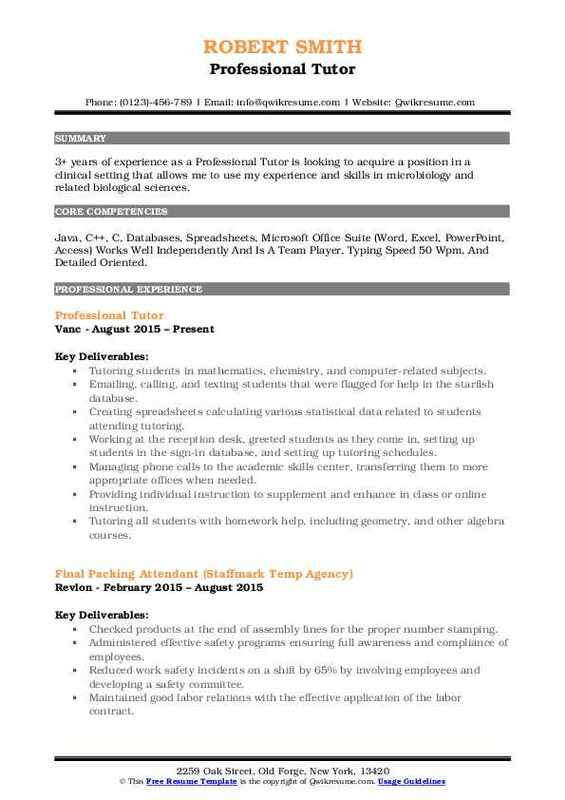 Skills : Site Management, Inventory Management, Training Others, Leadership, Microsoft Word, PowerPoint, And Excel. Assisting college students who need extra help understanding coursework related to mathematics, physics, and basic statistics. Work one-on-one with students using a three-step process of demonstrating an example problem, then having the student work a similar problem and lastly allowing the student to work problems and check their work for correctness. Repeat this process until the student understands this type of math problem. Working in a group, reviewing and preparing students for quizzes and exams. Interact with all members of the group ensuring all type problems were reviewed. Encouraging students to utilize educational support services and encourage students to approach new material and exams positively. Aid students realization that tutors assist them as they develop into independent lifetime learners. Accomplishments include improved mathematical, physics and basic statistics skills of college level students. Provide tutoring at multiple locations assisting students with non-traditional schedules the opportunity of tutoring availability. Tutoring numerous students in subjects ranging from basic mathematics to physics; specializing in college algebra. 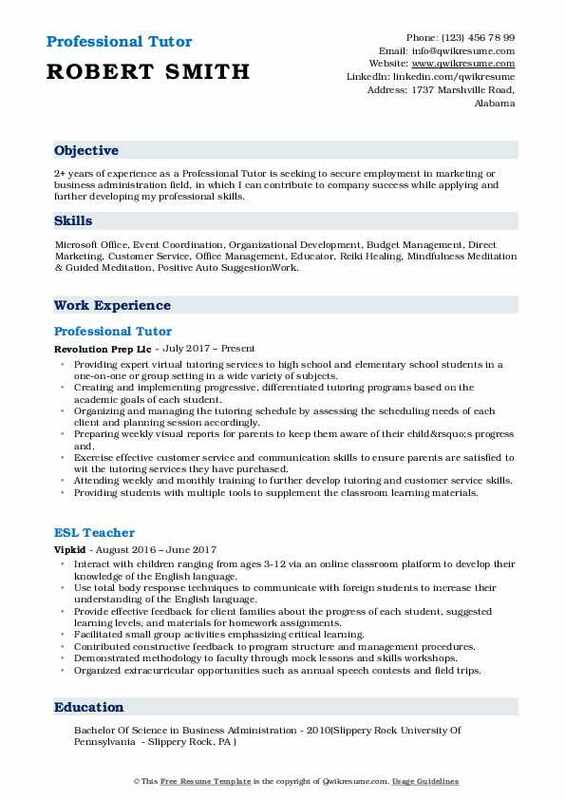 Objective : 2+ years of experience as a Professional Tutor is seeking to secure employment in marketing or business administration field, in which I can contribute to company success while applying and further developing my professional skills. Skills : Microsoft Office, Event Coordination, Organizational Development, Budget Management, Direct Marketing, Customer Service, Office Management, Educator, Reiki Healing, Mindfulness Meditation & Guided Meditation, Positive Auto SuggestionWork. Providing expert virtual tutoring services to high school and elementary school students in a one-on-one or group setting in a wide variety of subjects. Creating and implementing progressive, differentiated tutoring programs based on the academic goals of each student. Organizing and managing the tutoring schedule by assessing the scheduling needs of each client and planning session accordingly. Preparing weekly visual reports for parents to keep them aware of their child’s progress and. Exercise effective customer service and communication skills to ensure parents are satisfied to wit the tutoring services they have purchased. Attending weekly and monthly training to further develop tutoring and customer service skills. Providing students with multiple tools to supplement the classroom learning materials. 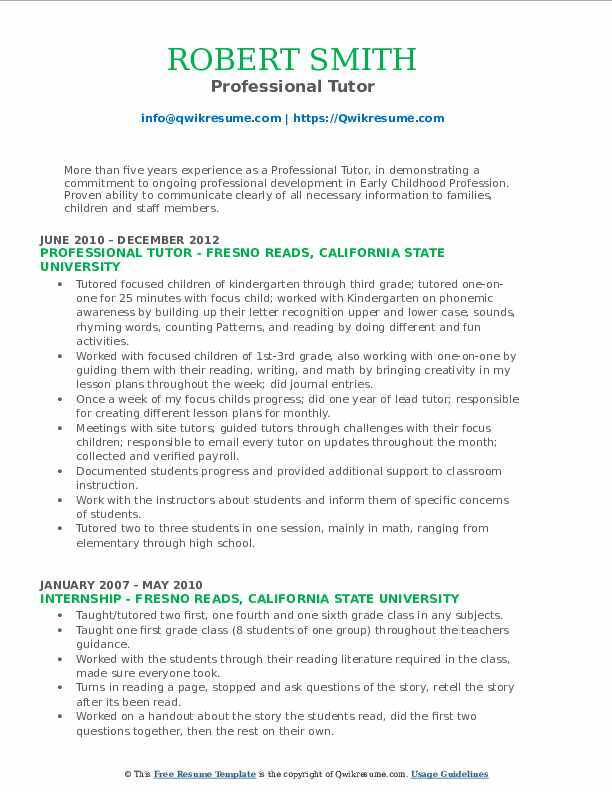 Objective : More than five years experience as a Professional Tutor, in demonstrating a commitment to ongoing professional development in Early Childhood Profession. Proven ability to communicate clearly of all necessary information to families, children and staff members. Skills : Bilingual Communication Proficient With Microsoft Word, PowerPoint, Excel, And Publisher Understanding, Patient, And Caring Positive Attitude. Tutored focused children of kindergarten through third grade; tutored one-on-one for 25 minutes with focus child; worked with Kindergarten on phonemic awareness by building up their letter recognition upper and lower case, sounds, rhyming words, counting Patterns, and reading by doing different and fun activities. Worked with focused children of 1st-3rd grade, also working with one-on-one by guiding them with their reading, writing, and math by bringing creativity in my lesson plans throughout the week; did journal entries. Once a week of my focus child's progress; did one year of lead tutor; responsible for creating different lesson plans for monthly. Meetings with site tutors; guided tutors through challenges with their focus children; responsible to email every tutor on updates throughout the month; collected and verified payroll. Documented students progress and provided additional support to classroom instruction. Work with the instructors about students and inform them of specific concerns of students. Tutored two to three students in one session, mainly in math, ranging from elementary through high school. Objective : 3+ years of experience as a Professional Tutor is looking to acquire a position in a clinical setting that allows me to use my experience and skills in microbiology and related biological sciences. 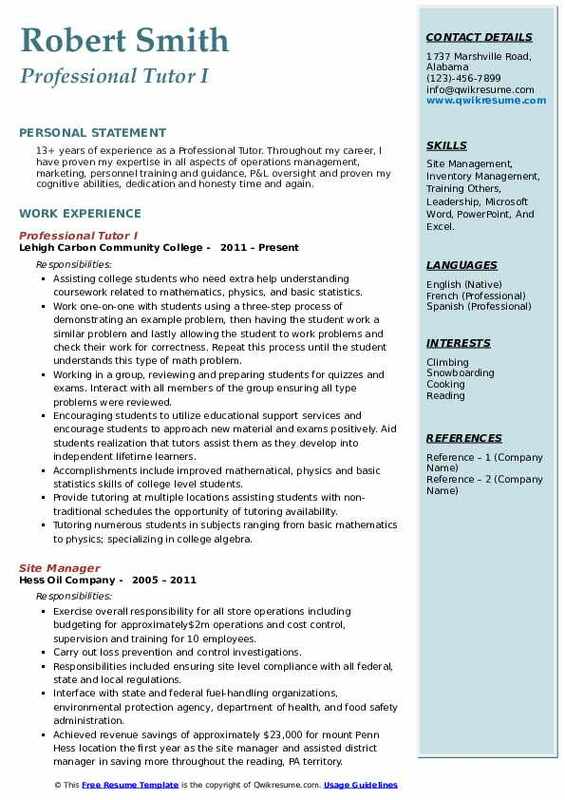 Skills : Java, C++, C, Databases, Spreadsheets, Microsoft Office Suite (Word, Excel, PowerPoint, Access) Works Well Independently And Is A Team Player, Typing Speed 50 Wpm, And Detailed Oriented. Tutoring students in mathematics, chemistry, and computer-related subjects. Emailing, calling, and texting students that were flagged for help in the starfish database. Creating spreadsheets calculating various statistical data related to students attending tutoring. Working at the reception desk, greeted students as they come in, setting up students in the sign-in database, and setting up tutoring schedules. Managing phone calls to the academic skills center, transferring them to more appropriate offices when needed. Providing individual instruction to supplement and enhance in class or online instruction. Tutoring all students with homework help, including geometry, and other algebra courses. Headline : 5+ years of experience as a Professional Tutor. Hardworking skilled worker looking for employment in any field where I may utilize my outstanding customer service skills in production and management with a sincere and dedicated effort to assist the company in meeting and exceeding their production goals. Skills : Microsoft Office, LABVIEW, C++, Windows, Mac OS X, Java, Matlab, Python, Analog And Digital Circuit Design/Troubleshooting. Tutoring students who need help in fields such as biology, basic math, and algebra, anatomy and physiology, nursing terminology, drug dosage calculations. Teaching student's certain studying habits that are time worthy, essential, and efficient. Preparing students for tests/quizzes is another task that is also offered as well. Making and problem-solving skills, using a combination of the sylvan sync program with iPad and hands-on teaching. Set daily goals and lesson plans directed to prepare our students for academic learning by emphasizing decision. Creating and providing intensive individualized workload for each student to meet parents expectations. (grades 2 - 11). Filled in for the professor when she could not make a class but did not want to cancel. 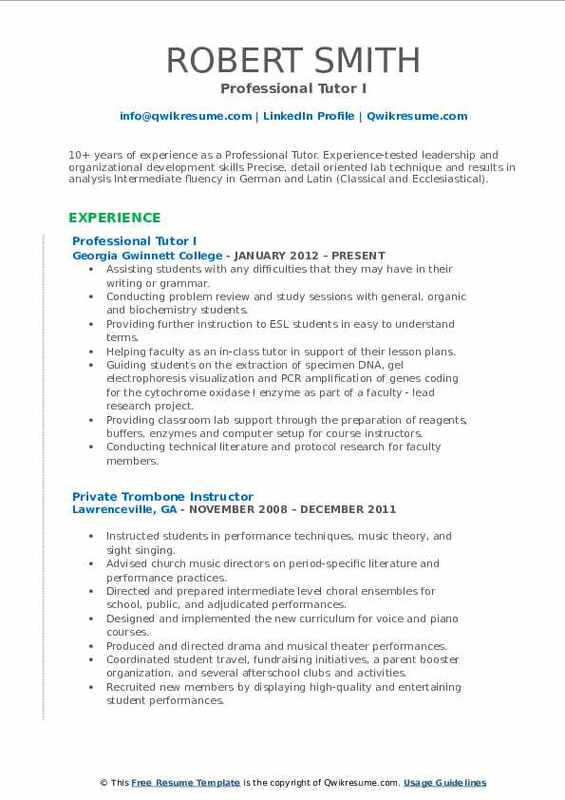 Objective : Over 3 years of experience tutoring, along with living through the student experience. Supplemental instructor for many different instructors in developmental math, statistics, and algebra gave an opportunity to experience and reproduce a variety of teaching styles. Skills : Scheduling, Basic Laboratory Techniques, Aseptic Technique, Calibration, Westlaw Next Certified, Legal Research, Research, And Microsoft Office Proficient. A lead tutor in the Place, a tutorial lab located on the second floor of the grand rapids community college library, tutoring students who are taking introductory courses including English, math, reading, basic psychology, and basic computers. Facilitating sessions in the fast track program; a program designed to provide an opportunity for students to gain the knowledge required so they can test out of introductory courses in college, such as pre-algebra. Providing academic support in programs such as Wyoming middle college and the grand rapids learning center where youths in high school are taking courses at grand rapids community college. Assisting in the academic support office, answering phones and assisting callers with their academic support questions as well as occasionally orientating students to the tutorial services that are available on campus. Taking skills, how to write a paper, as well as provided editing on assignments. Several times i. Providing extra help to struggling students, taught them study techniques, note taking skills, test. Facilitating course curriculum by providing additional educational support to math and science students from kindergarten through college. Design science-based and custom activities and lessons which allow students to significantly improve their skills and knowledge in challenging subject matter which allows them to be successful in school.